S.O.S. For Our Flying Bug Eaters: Registration is open! The Wisconsin Bird Conservation Initiative and Bird City Wisconsin are sending out an S.O.S. for our flying bug eaters. 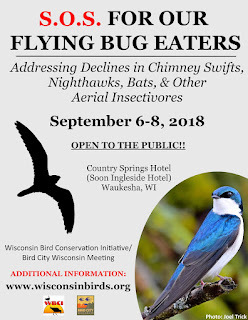 That is, in fact, the title of a conference scheduled Sept. 6-8 in Waukesha that will look at the issues -- and potential solutions – for long-term declines in Wisconsin’s aerial insectivores. This joint Wisconsin Bird Conservation Initiative (WBCI) Annual Meeting and Bird City Summit will feature the latest research on Chimney Swifts, Purple Martins, nighthawks, swallows, flycatchers -- and bats. The Thursday night through Saturday afternoon conference kicks off with both a Birds & Brews event and a Swift Night Out field trip. “If you haven't yet witnessed dozens - or hundreds - of swifts going to roost in the evening, this event may be your chance,” said WBCI Chair Karen Etter Hale. Keynoting the conference is Dr. Pamela Hunt, senior biologist in avian conservation at New Hampshire Audubon. A registration form and complete agenda are on the WBCI website at http://www.wisconsinbirds.org/annual-meetings/2018-wbci-annual-meeting/. Be sure to reserve early for room discounts at the Country Springs Hotel & Conference Center. This conference is sponsored by the Wisconsin Department of Natural Resources, Natural Resources Foundation of Wisconsin, American Bird Conservancy, Madison Audubon Society, Western Great Lakes Birds & Bat Observatory, and Wisconsin Society for Ornithology. Additional funding was provided by the Wisconsin Metro Audubon Society, 1000 Friends of Wisconsin, and Jaeger-Mellerop Family Charitable Trust. Wisconsin Audubon Council. Powered by Blogger.